Best Day and Night Vision Binoculars of 2019 - Do NOT Buy Before Reading This! Why Do You Need Day/Night Vision? There are tons of points to consider before you make a purchase. Here is a concise summary of the most important features of the top three products. Bushnell is a well-known manufacturer of premium quality optical gear. It is no surprise that one of the items on the list was produced by them namely the Bushnell Prism Binocular. 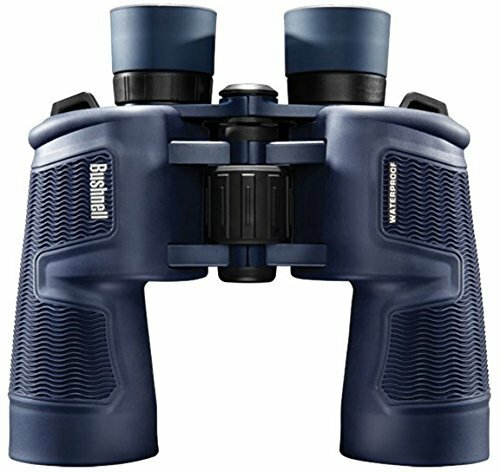 You can buy the Bushnell H2O Waterproof/Fogproof Porro Prism Binocular in several magnification ranges. We will be looking at the 10x42 model which means that the image will be seen as ten times closer than it is. This magnification is ideal for big game hunting as it is unlikely that you get much closer to the animals. The product is made with BAK 4 prisms which are multi-coated. These types of optics improve the refraction of the lens and therefore amplify the amount of light that you see through them. Multiple coats on the lens further enhance your ability to see at night. These technologies won’t negatively affect the way you see during the day. So, they work well in all kinds of light conditions. Bushnell sealed the product well, so it is waterproof and also fog proof. It is the ideal binoculars if you are going hunting in the rain or close to water. The most significant downside of this product is its hefty price. But as you look as you take care of it, this binocular will give you years of great service. The next product on the list was produced by Kylietech. 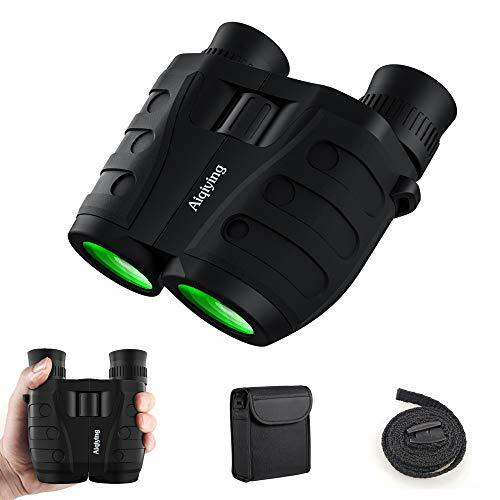 These day and night vision binoculars are made with BAK4 Prism and Multilayer-Coated Optics. Because of this, the image that you see them are bright and crisp even in low light conditions. In addition to his, the lenses are coated with FMC (fully multi-coated) green film objective lens. The eyepiece-optical is made of blue FMC coating. They are great at reflecting light so that your vision is improved. Just remember that they can see at night but not when it is pitch black. Kylietech brought this model out in 12x42 magnification. The amplification is much higher than most optical that are used for hunting. 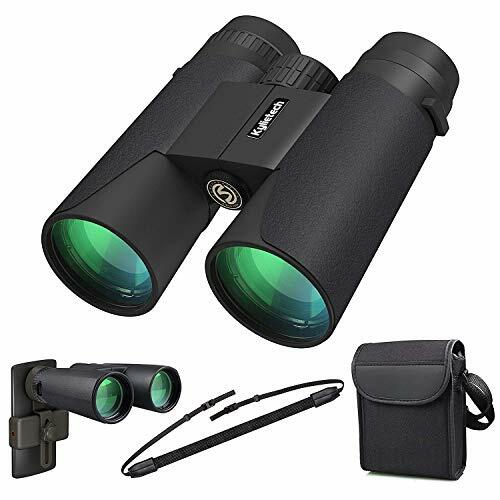 These binoculars are a fantastic option for hunters who are looking for the smaller game or want to spot them at greater distances. One of the best features of this product is that it comes with a smartphone adapter. The tool helps you to use your phone to take pictures of the image that you are seeing through the binoculars. It will fit any cell phone that is under 5.5 inches in width. Another benefit is that the product is fog proof and waterproof. On top of this, it is made with an anti-slip grip. 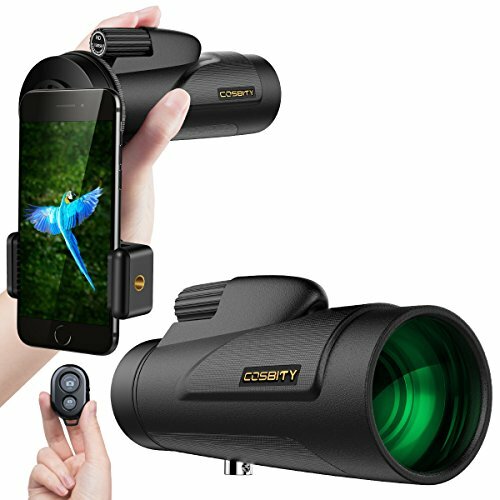 Cosbity has also manufactured day and night vision binoculars that can be used for hunting. Like other products in the review, the lenses are multicoated. In this case, the coating is a green film. The film is what allows you to see in low light conditions by improving the reflection of the light in the environment. It does not work as well in darker conditions as some other products which feature a prism design as well as coated lenses. So, they won’t be suitable to use when it is very dark. The product has a much higher magnification than most hunting binoculars. It is 12x 50. So, like the Kylietech binoculars it is a good option if you need to spot game from farther away. Cosbity has made the product with a thick and sturdy rubber armor which will protect it if you let it fall or bump it. Unfortunately, it is not as well protected from moisture and water like other products on the market. One benefit of the product is that it comes with many bonus features. It has a carry bag and strap. It also comes with a smartphone adapter which you can use to take photos with or make video recordings. 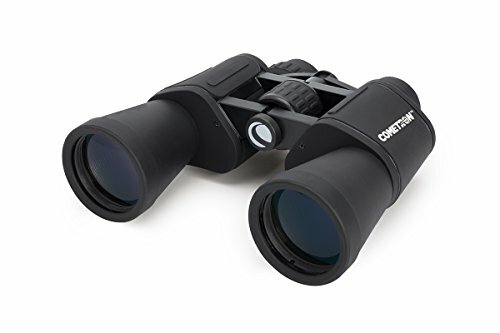 The Celestron 71198 Cometron is another day and night vision binocular. It was made specifically for astronomical use, but it works well for several activities including hunting. Celestron used multi-coated optics in this product to improves its light transmission. It also has very wide lenses which help to gather light. All of this means that it works great on clear nights and other low light conditions. On top of this, Celestron designed the binocular to have a BK-7 prism. Luckily, this isn’t the only significant feature of the product. The Cometron is 7x has a 50mm lens which is quite broad. This width can improve the optical capabilities of the binoculars and means that you can see much more at a time. The downside of this is that it makes the product heavier and affects its balance. One of the best features of the Cometron is that it comes tripod adaptable. You can directly mount it on a tripod if you are going to stay in one place for a while. The binoculars eyecups are soft and were designed by Celestron so that it can more easily be used with glasses. So, it is an excellent option for people who wear glasses. The Cometron is quite cheap but unfortunately, its quality suffers as a result. The next product on the list is very different from the others on the list. It is the Aiqiying Compact binoculars. These day and night vision binoculars feature BAK-4 prisms that are multi-coated. The purpose of this is to increase its light transmission. It can be used in low light conditions but not in the complete dark. The light transmission is slightly weak. The product’s magnification is 12x times which is the recommended amount for hunting. The model comes with a 25mm lens which is a bit narrow. However, this means that the view is much smaller than that of other products, so it can be more challenging to use. Therefore, you might consider using this alongside a stronger set. Luckily the binoculars can be carried around with ease. They are tiny compared to the other products in the review. You will be able to hold it in one hand. On top of this, the binoculars came with a strap and a carrying bag. Aiqiying designed the binoculars to have soft eyecups. Because of this, they can be adjusted, and you can use it with glasses. 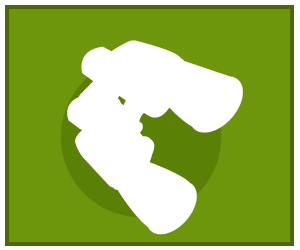 The body of the binoculars is curved which means that they are comfortable to hold. One downside is that the eyepieces are quite close together and that not everyone will be able to adjust it enough. ATN Binox X-HD is a worthy investment if you really want to have the upper hand while viewing wildlife. This binocular is a roof prism design. That said, it is compact, lightweight, and easy to maneuver. This model edges the competition in a range of ways. First, it’s usable both day and night. So you won’t be totting around a number of binoculars if you intend to stay late into the night. Secondly, this is a Smart model. It sports a gyroscope for image stabilization. This feature coupled by the onboard rangefinder and 16x magnification makes this model the best day and night vision binoculars for hunting. There’s more! ATN Binox-HD also boasts E-compass, E-zoom, Wi-Fi connectivity, and GPS. If you wish to record videos for later playback, the Binox-HD records at 1080p full HD resolution at unbelievable 30fps. If you have ever gone hunting, you will know the frustration of struggling to see the animal you are stalking. Binoculars are an excellent tool that you can use to solve this problem. If you are planning to go hunting in the dark, you need to have gear that can help you to see better. Goggles and binoculars that use infrared and similar technologies to spot your target at night are fantastic at what they do. However, they have definite downsides. They are extremely expensive, you have few choices, and they can only be used in the dark. They were developed by and are still mostly used by the military. There are several reasons why you should instead buy day and night vision binoculars. They cost a lot less, and you have hundreds of choices. Their best feature is that you can use them during the day, in the dark, or in low light conditions. They work by amplifying the amount of light that comes in through the lenses or how you see it. Most of them will make the environment appear less dark. You will be better to look at your surroundings and the animals in it. There are several techniques that manufacturers use to enhance your vision. The products in this review feature several different technologies. These are typically divided into three generations which refers to when the technique was developed. These are the oldest night vision technologies. They were developed in the 1960’s and featured a series of image intensifier tubes. Unfortunately, these binoculars can be quite heavy and bulky. Second gen was made possible by the microchannel plate (MCP) electron multiplier. They replaced the need to use multiple tubes. As you might guess, they are lighter and smaller than previous models. The next leap forward involved the development of two new technologies. Firstly, the ion-barrier film on the MCP which dramatically increases the working life of the tube. Secondly, the gallium arsenide (GaAs) photocathode which allowed you to see much farther while it is dark. These devices tend to be of a much higher quality but also cost more. You will still find products from each grouping on the market in 2019. Binoculars use a set of glasses and prisms to magnify distant things, animals, and people. Manufacturers use different engineering techniques to arrange these magnification elements in the 2 parallel optical tubes. These binoculars have lenses that are notably wide apart. This feature offers excellent 3D images. Again, since these binoculars have simple engineering requirements, they tend to be pocket-friendlier than Roof prism rivals. The only problem? They are heavier and chunkier. As such, you’ll need to create enough room for them if you move around a lot. These have a narrow theme. They are also lighter than the Porros and, therefore, easily portable. These models sport decent optical engineering. As such, they have far much better images. As expected, they are also relatively pricier. The last two decades have seen a boom in technological advances. As such, we often want and expect our gadgets and devices to do more. Luckily, contemporary night vision binoculars often come with new features that give you much more utility. They specifically feature ways with which you can use your smartphone with your binoculars. Many products on the market are now sold with adaptors for your cell phone. The primary purpose of these is to allow you to take photos of the image that you are seeing with your binoculars. Imagine how exciting it would be to be able use your camera to take photos or record videos to capture your experience. It is fantastic that you will be able to do this without much effort or fuss. If you would like this feature, I would recommend buying a binocular that comes with its own tailor-made adapter. That way you know that it will work. Check out this Youtube video below for more information on choosing one. What type of hunting are you doing? How much do you need your vision to be amplified? Binoculars are made with a range of strengths depending on how far you want to see. For hunting, the best overall magnification is 10 x 42. Anything less might be too little while higher counts are mostly unnecessary and can be distracting. It will influence the distance you can see and the amount of details you can make out. When shopping for the best binoculars for stadium sports, hiking, and water sports applications, a model with 7x-10x magnification should suffice. For bird watching, you need a unit with higher magnification and larger lenses 42-50mm to help you view the birds’ characteristics from afar. Ideally, you want to find binoculars that are able to withstand the challenging conditions in which you will find yourself. Think of getting a product that is waterproof and fog proof. A bonus would be to buy binoculars that are shock resistant and have features that protect it from bumps and falls. Binoculars come in a variety of vision ranges. They can be broad, narrow or somewhere in between used. Which one you want depends on your own preferences. We will cover this in the description of each product. Eyecups help with eye relief when using the binoculars. They place the image at a perfect distance for easy viewing. If you use prescription glasses, or if you intend to share the binoculars among other people, consider a model with adjustable eyecups. Manufacturers can choose from several technologies to improve their light transmission. The really high-end binoculars use infrared, thermal and similar features. But these are extremely expensive. The majority of products can help you to see better in low light conditions by amplifying the light waves in the environment. While hunting you want to be agile and quick to react. Your binoculars shouldn’t hamper you in any way. They shouldn't be too heavy nor too big. It is a great plus if the binoculars come with a carry case or bag. It should have some kind of strap attached to it. When evaluating the ergonomics of your ideal binoculars, pay close attention to the weight, size, and the materials used. It’s also worth checking out the position and size of the focus wheel in relation to the user’s size of the hand. Ensure that you can reach it without much hand strain. Here, check out the binoculars’ rating. Are they waterproof, fog-proof, or weather resistant? If they have no rating, they are probably not safe for use in rainy conditions and the sea. Magnesium alloy – it’s lighter than aluminum and, therefore, more ideal for prolonged holding in hands. However, its lightweight design may also cause fatiguing. Its key strength is that it’s strong. Polycarbonate - Binoculars made of heavy plastics are generally durable, corrosion proof, and inexpensive. Again, they are temperature resistant. 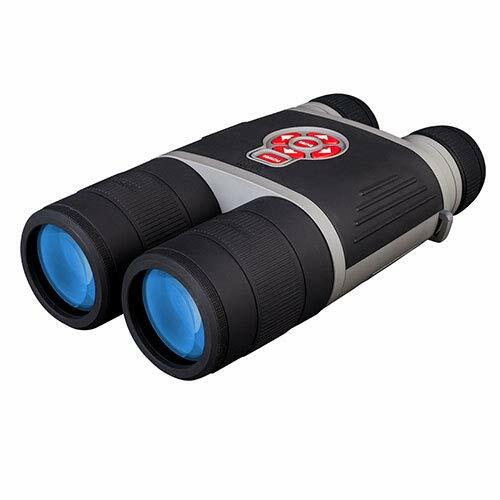 Binoculars with metallic chassis experience regular expansions and contractions which may affect the arrangement of the electronics given enough time. That said, which are the best binoculars in 2019? The review lists five of the best day and night vision binoculars for sale in 2019. All of these products will get the job done. However, my personal favorite is the Bushnell H2O Porro Prism Binocular. The Bushnell has a magnification of ten and a lens of 42mm which is ideal for hunting. The manufacturers used Bak4 prisms and multiple coatings to improve its light transmission. It’s extremely high quality makes it stand out. But it is very costly and is probably not the right choice for everyone. What do you think of these binoculars? Tell us in the comments and feel free to share the article.